We all know that the Internet has revolutionized the way patients find Cosmetic and Plastic Surgeons. For example, think about the fact that even when someone remembers your name from a print or other ad, she’s not going to remember your phone number . . . and she’s not going to go to the yellow pages to get it, she’s going to go to the Internet. We all know that there are a lot of physicians who aren’t board certified in plastic surgery who are poaching in our territory, confusing patients, and increasing competitive pressures. And we all know that discretionary income is down, which means elective surgeries are down, which means income is down for most of you. It may not seem right that surgeons increasingly need to be superb marketers as well as superb surgeons and artists, but that’s the way it is. I can’t cover the whole marketing picture here (smart, cost-effective advertising, an appealing website, excellent phone answering, professional patient coordinators, a great office staff, etc.) 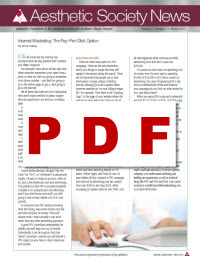 but here are a few thoughts about a much-misunderstood facet of Internet marketing—the Pay-Per-Click ad. Horror stories abound, because “Pay-Per-Click” (or “PPC”, or “AdWords”) is deceptively simple. It’s easy to create an account, write an ad, pick a few keywords, and start advertising. The problem is that PPC is actually fiendishly complex to do properly and cost-effectively, and if you don’t know your stuff, you ARE going to lose money, maybe a lot of it, very quickly. So someone tries PPC without knowing what he’s doing, loses some money real quickly, and tells everyone he knows “This stuff doesn’t work,” when actually it can work better than any other advertising approach. There are three main parts of a PPC campaign. There are the ads themselves, which you design in hopes that they will appeal to the person doing the search. There are the keywords that people use to find information, and that you bid on so that Google shows your ad when someone searches on “no scar lollipop breast lift,” for example. Then there is the “Landing Page”, or the page of your website where the searcher is taken when she clicks on the ad. I could write 50 or 100 pages on each of those three components. Suffice it to say here that all three are important, and have to be done right, or you will hemorrhage money. As a simple example, consider bidding on “breast lift” vs. bidding on “no scar lollipop breast lift.” Which one will get you more clicks? Of course, “breast lift” will. But which term will cost you a lot less, and which searcher is a lot closer to picking up the phone if she likes your landing page? A well-run campaign can bring visitors to your website who are so targeted, and so likely to become your patient, that for every dollar you spend, you get a bottom-line return of $3.00, or $5.00, or $15.00. Or more. As one example, a plastic surgery practice which had been spending heavily on TV, Radio, Yellow Pages, and Print for over 20 years halted all that, initiated a PPC campaign, and reduced its advertising cost per consult from over $300 to less than $100, while increasing its market share by over 50%. And all that happened while reducing monthly advertising from $30,000 to just over $20,000. Of course, if you’re smart, you don’t start out spending a lot of money, even if you’re used to spending $5,000 or $10,000 or $15,000 a month on advertising. You start off spending $50 a day, and you methodically refine and improve your campaign as you find out what works for you, and what doesn’t. When you spend $50 a day and consistently get back $75 (or $100, or $250, or $750) a day, you ramp it up and budget $100 a day, and then $200, and then $500, and then $1,000. The bottom line is that a well-conceived and well-executed Pay-Per-Click campaign can bring you leads less expensively than any other advertising modality can. Since such a small percentage of the public is your prospect, radio, TV, and print can never be as cost-effective as PPC, because you’re not paying unless someone is interested enough in your ad to click on it. If you’re not already using the Internet aggressively in your marketing, you should certainly consider it.